A great Christmas apron for the festive wino in your life. If you or a loved one loves their wine a little too much around the holiday period this is a a perfect apron. 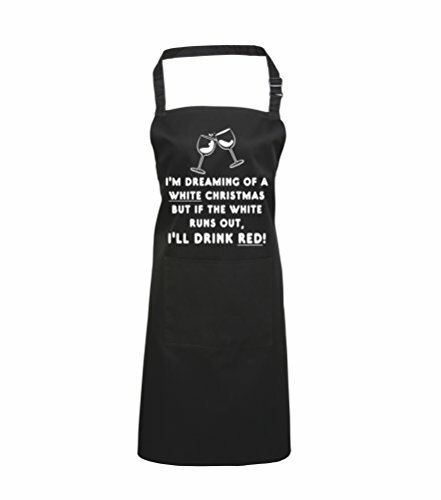 The apron features an illustration of two wine glasses and has the slogan – I’m dreaming of a white Christmas, but if the white runs out, I’ll drink the red! printed on the front. 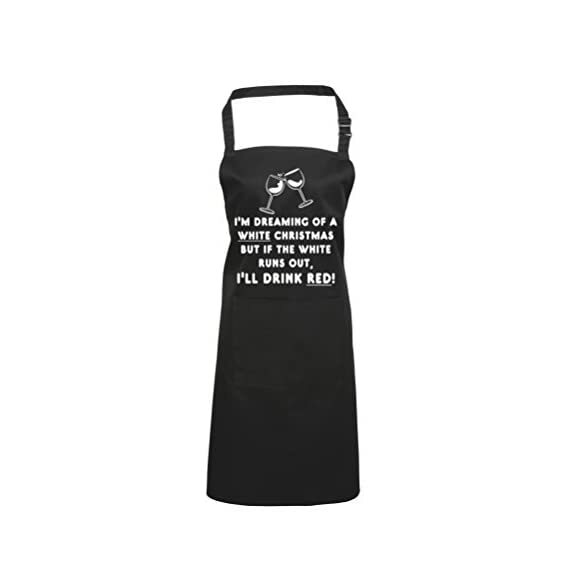 This Christmas apron is ideal for both men and women and can be purchased in red, black, pink, green, navy and purple. The Christmas apron is made from 65% Polyester and 35% Cotton twill and is machine washable at 40 degrees or less. This novelty Christmas apron also features a large front pocket, allowing you to keep all your accessories close to hand while in the kitchen. It also features long neck and waist ties making it suitable for a wide range of body types.